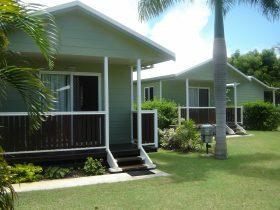 Palm View is a small, high-quality holiday apartment complex located in a lush, tropical garden setting. 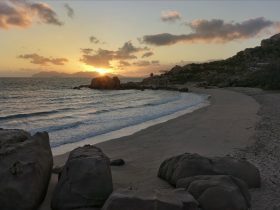 Perfectly positioned, 100 metres to the sea and close to all of Bowen’s delights. A scenic walking track begins adjacent to the property and parks, shops and an ocean front golf course are just a short stroll away. There is also a local bus service available from the front door. 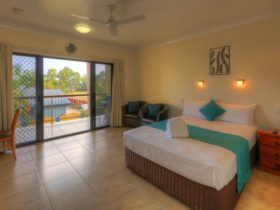 As a guest at Palm View you will enjoy your ‘home away from home’. 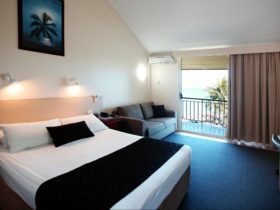 Relax by the sparkling pool or visit one of the beautiful beaches (some of the best North Queensland has to offer). Make use of their fully-equipped covered barbecue area. You’ll be delighted by their self-contained apartments which include everything you need to enjoy your holiday. Catering for business or tourist travellers. 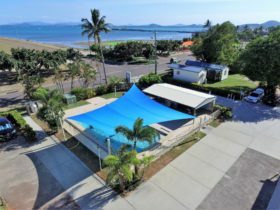 Bowen is located at the ‘top of Whitsundays’ and offers live, unspoilt, fringing reefs consisting of beautiful coral and reef fish right off the beaches. Come for a shore dive or snorkelling adventure with them right here in Bowen and see the exciting and colourful underwater world. 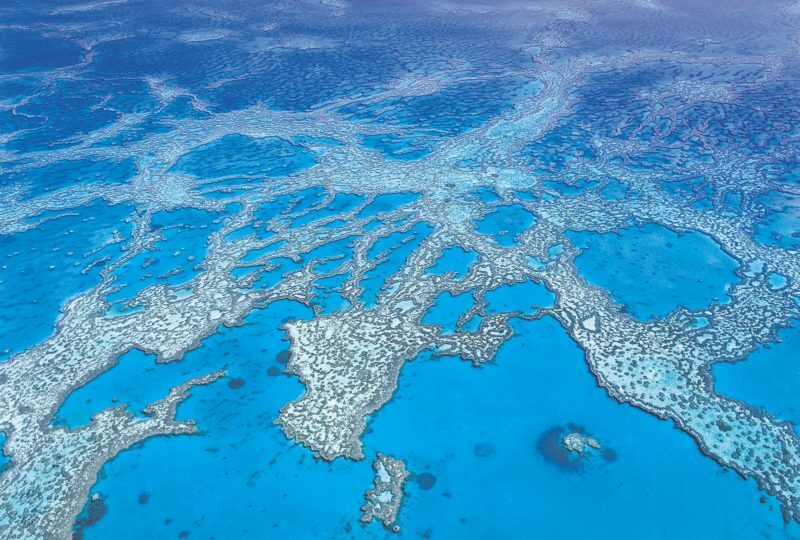 Outer reef and island excursions to Airlie Beach are available through the on site tour desk. Come and be their guests. This is a proper “one bedroom flat”. This one bedroom apartment with en suite off bedroom has a queen bed plus single bed in bedroom. Hard-wired ADSL Broadband internet access in apartment, telephone, separate lounge room. 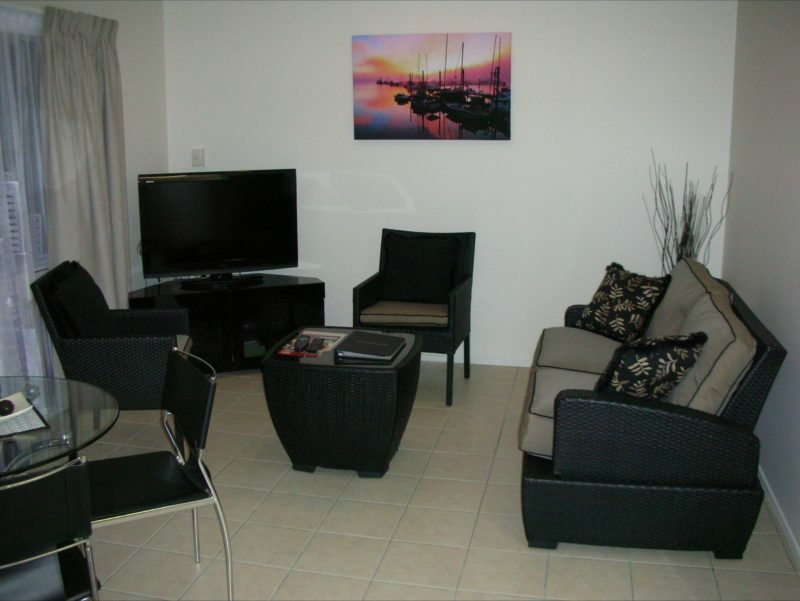 Two lounge chairs, two-seater couch, coffee table, 40 inch flat screen television, Bluray DVD player, Austar with Fox Sports one, two and three, and full kitchen including dining table and chairs, full refrigerator, regular size oven and stovetop, microwave and all the crockery and cutlery you will need. Fully self-contained with all linen and equipment provided. This apartment has the same layout as the superior apartments, however has not had living room furniture and bathroom vanity updated. This apartment sleeps five. Full size two bedroom apartment on first floor. This is a very large unit with full size kitchen including dishwasher, limited water views from front balcony and back door leading to pool and barbecue area. Main bedroom has queen bed, second bedroom has two single beds. Double size futon in living area. One bathroom with entry from hallway. Hard-wired ADSL Broadband internet access in apartment, telephone, 42 inch flat screen television, DVD player, Austar with Fox Sports one, two and three, dining table and chairs, large side by side refrigerator, regular size oven and stovetop, microwave and all the crockery and cutlery you will need. Fully self-contained with all linen and equipment provided. This is a proper “one bedroom flat”. This is a one bedroom apartment with modern en suite off bedroom. Queen bed plus single bed in bedroom. Hard-wired ADSL Broadband internet access in apartment, telephone, separate lounge room. Two lounge chairs, two-seater couch, coffee table, 40 inch flat screen television, Bluray DVD player, Austar with Fox Sports one, two and three, and full kitchen including dining table and chairs, full refrigerator, regular size oven and stovetop, microwave and all the crockery and cutlery you will need. 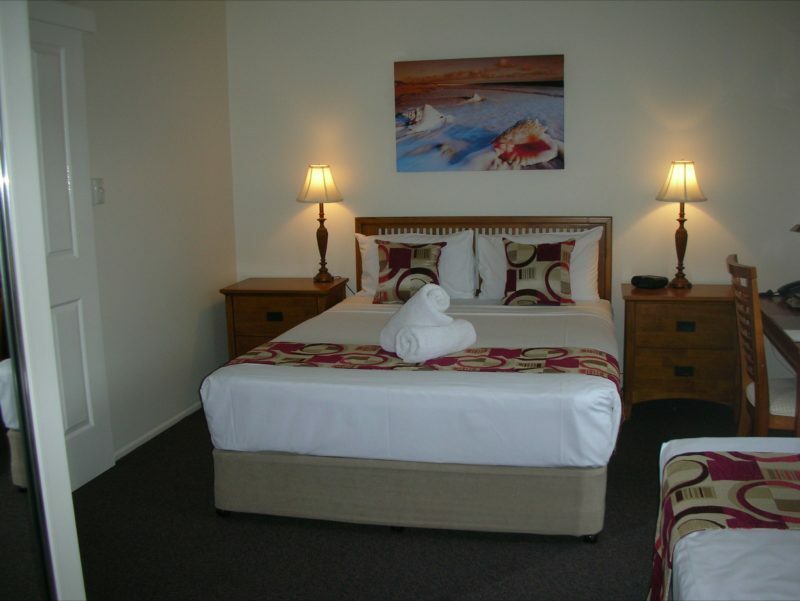 Fully self-contained with all linen and equipment provided. Studio Villa Cabin (their only cabin). 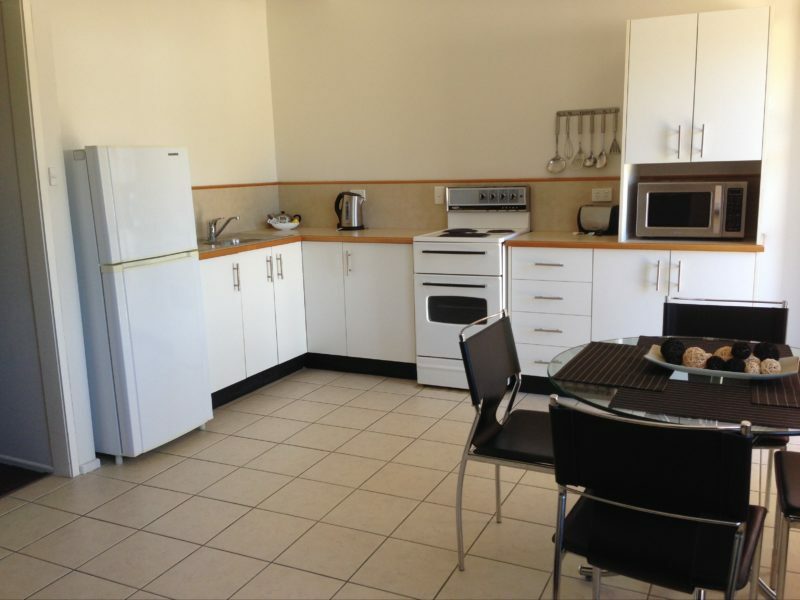 This apartment is self-contained and air-conditioned, has broadband internet access, telephone, is fully equipped with all cooking utensils, plus linen and blankets are provided. 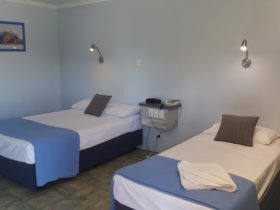 Double bed and double bunks with ensuite. Room contains two lounge chairs, coffee table, television, DVD player, Austar with Fox Sports one, two and three, and full kitchen (small) including dining table and chairs, medium sized refrigerator, small oven with two burner hotplate, microwave and all the crockery and cutlery you will need. Maximum two adults and two children.